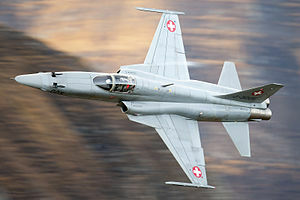 After winning the International Fighter Aircraft competition in 1970, a program aimed at providing effective low-cost fighters to American allies, Northrop introduced the second-generation F-5E Tiger II in 1972. This upgrade included more powerful engines, higher fuel capacity, greater wing area and improved leading edge extensions for a better turn rate, optional air-to-air refueling, and improved avionics including air-to-air radar. Primarily used by American allies, it remains in US service to support training exercises. It has served in a wide array of roles, being able to perform both air and ground attack duties; the type was used extensively in Vietnam. A total of 1,400 Tiger IIs were built before production ended in 1987. More than 3,800 F-5 and the closely related T-38 advanced trainer aircraft were produced in Hawthorne, California. The F-5N/F variants are in service with the United States Navy and United States Marine Corps as an adversary trainer. Approximately 500 aircraft are in service as of 2014.